If you don't wanna use Google Earth there's also an online option: Google Maps - Mars. About Google Maps - Mars. Maas Digital created this animation of the Mars Exploration Rover mission for Cornell University and NASA/JPL in 2003. 24fps, Sound Effects Only version. NASA's Mars Exploration Rover Mission (MER), is an ongoing robotic space mission involving two rovers, Spirit and Opportunity, exploring the planet Mars. 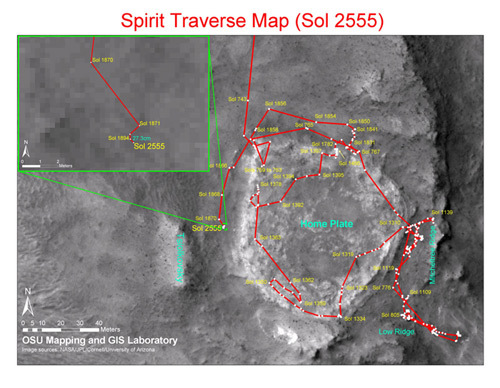 It began in 2003 with the sending of the two rovers — MER-A Spirit and MER-B Opportunity — to explore the Martian surface and geology. Where are Spirit and Opportunity now? In the right menu of this page you'll find more links that will help you on your way. Where are the Rovers now?